We set our alarm for 6:30am and were on the sleds by 7. After arriving at the only gas station in town, we realized they didn’t open until 9am! Unfortunately we had already locked our room and left the keys inside. It had to be around 0 degrees and it was extremely windy. Luckily we were able to wait in the foyer of another building next door to stay warm. At 8am the Tamarack restaurant opened, so we went there to get some breakfast. As luck would have it, the gas station owner came to this same restaurant each morning to get some coffee. He was a nice guy and opened the gas station 30 minutes early for us. This all worked in our favor, but we just didn’t know it yet. While we were waiting for the gas station to open, the groomer was headed towards us. By the time we got gas and headed out of town, the groomer had the entire trail in perfect condition! We cruised up Brockway Mountain without hitting a single bump! After heading West on trail 3 from Brockway Mountain, we rode the first 40 miles of trails without seeing another sled! Even after we saw some other sleds, the trails were in excellent shape. We stopped in Lake Linden for breakfast and then headed for home. The entire way home, I think we might have hit 2 bumps. Unfortunately when we left Rockland on trail 13 we came across an accident. The guy was pretty shook up (he hit a tree) but he seemed like he would be ok. After helping them get back to Henry’s Never Inn, we headed for Bergland. Trail 13 was in great shape the whole way to Bergland. After getting on lake Gogebic we rode to the Lake Gogebic Lodge and then rode into Marenisco to get gas. We then headed south on Trail 1 into Presque Isle and then trail 6 West to Winchester. This was by far my best ride to Copper Harbor ever. One of the best things was I got to do it with my Dad! Today was the start of a much longer ride. We left around 10am for Copper Harbor and both agreed to take our time getting up there since we had a room for the night. After pulling out of the yard, one of the sleds had some fouled plugs, so we changed those and were on our way. Trail 6 East into Presque Isle was in great shape and so was trail 1 North to Marenisco. (I’ll bet there were maybe 5 or 6 sleds on these trails before us since they were last groomed) After getting gas at the Marenisco mini mart, we made our way up trail 1 to Fishtales pub n grub. If you are ever in the Lake Gogebic area, this is a must stop! They have Walleye and Eggs for breakfast. Yea, I know it might sound a little odd to some people, but once you have it, you’ll be “hooked”! After our great breakfast we rode Lake Gogebic into Bergland and hooked up with trail 13 North towards Rockland. The first half of trail 13 from Bergland to Rockland was in excellent shape! Then we switched to another trail system on the second 1/2 and it got very bumpy. This section is pretty narrow and tends to get rutted up pretty quick and it definitely was today! Once we passed Rockland and got on trail 3 North, things got a lot better! From this point on, we rode nothing less than “9” to “10” rated trails! We stopped at Parkview in Twin Lakes for a drink and then gassed up at the BP. Then we cruised in to Houghton! After making our way across the bridge we continued on trail 3 towards Copper Harbor. Along the way we decided to take another route up through Eagle River (Michigan) then over through Eagle Harbor. We stopped at the Eagle Harbor Inn for a drink and then finished our route into Copper Harbor. We arrived at the Mariner around 8pm and checked in. After unloading our stuff in the room, we hit the restaurant for some great food and fun. We headed out of Winchester around noon and made our way towards Bergland. It ended up snowing another 2-4 inches yesterday, so that helped to fill in the holes created by the thaw on Saturday. Trail 6 East was in better shape and trail 1 North was in great shape. We got gas in Marenisco and then headed for the Lake Gogebic Lodge. A few days ago the lake was very slushy, so we were reluctant to ride the lake, but it was in fair condition. The main problem was hitting the ice chunks that were slush and then refroze. After arriving in Bergland we hung out for a bit and then jumped back on the lake. This time we rode to Fishtales and got off there. The lake had decent snow close to shore most of the way to Fishtales, once you got South of there, it was pretty bare. We made a trip to Bergland today. Trail 6 East was pretty beat up as well as trail 1 North out of Marenisco. The closer we got to Bergland, the better trail 1 got. Unfortunately the temperature got up to 40 degrees and melted the trails down pretty hard. We stopped in to Hoop N Holler for some food and a drink. Then we headed back down trail 1 to Marenisco. We decided not to run Lake Gogebic on the way back because it was a soupy mess. They are calling for more snow tonight, hopefully we will get some! We set out for a short ride to break in my brother (he lives in Florida). We took trail 6 East to Presque Isle then trail 1 North towards Marinesco. Both of these trails were in good shape with a few bumps in different areas. Once we got on the Michigan trails they smoothed out a bunch and we were able to cruise along pretty good. We hooked up with trail 2 East and it was perfect! After hitting local trail 13 south we made our way to Rogers bar. If you are out riding and want a pizza or something to drink I’d highly recommend checking out Rogers bar (http://www.rogersbar.net). Sue and Greg are both great hosts and will take good care of you. We left Winchester, WI this morning and took trail 6 West around Birch Lake and hooked up with trail 11 North. Trail 6 was in great shape and so was trail 11 until we got into the woods. It was pretty obvious that once we were in the woods, the groomer hadn’t been in there. This area is known to be wet until a little later in the season. Trail 11 was also rerouted from last year, so be careful if you think you know this trail. We ended up making a wrong turn and got to stare a locked gate in the face. The snow was pretty deep and we had a rough time getting our sleds out of there. We found the trail again and were on our way. I’d estimate 18-22 miles of bouncing around through the woods. There was also some logging on this trail, which probably explains the reroute. Once we got out of the woods the groomer had done an awesome job! The trail was flat as could be and plenty of fresh powder on top! We got to trail 8 and headed West to Bingos bar and motel. After pizza and a drink we rode into Wakefield to get gas. We fueled up and then headed East on trail 8 then South on trail 11 then East on trail 2. This is where we hit the best trail of the day! It is an old rail road right of way that is flat and long! We cruised this trail all the way into Marenisco and shot some videos along the way. If you are thinking about coming up, maybe this video will convince you! We rode from Winchester, WI to Presque Isle, WI….got gas and bought trail stickers for Michigan ($25/ea this year). Then we headed north up trail 1 through Marenisco towards Lake Gogebic. The trails were flat as could be and we only saw a handful of sleds. We jumped on Lake Gogebic and headed for Bergland. The lake was in good shape with a few fishermen in their ice shacks. There were a few slushy spots that had re froze, other than that it was full of fluffy powder. After arriving in Bergland we gassed up and got lunch at Antonios. We heard a rumor that the trail into Bergland was closed, but this turned out to be false. It was closed earlier this month, but it is business as usual now. After lunch we decided to take the trail back instead of running the lake. This was a great choice! We got behind the groomer and rode a perfect trail for 20-30 miles! Once we passed the groomer, the trail was still in great shape! We rode through Marenisco and then made our way South to Presque Isle, WI. If this ride is any indication of how this season will end up, it should be one of the best ever! 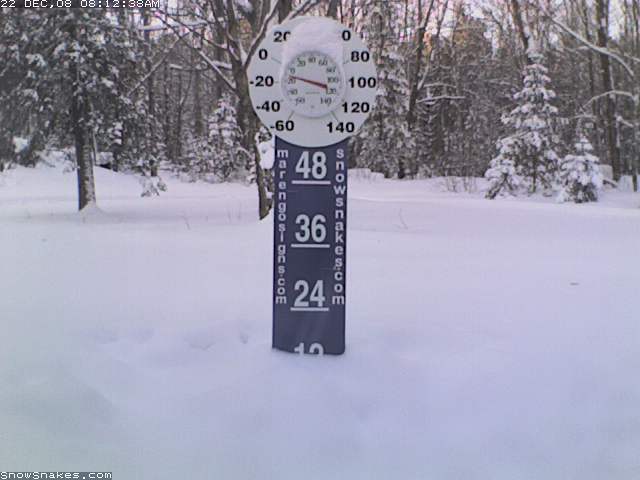 You are currently browsing the Snowmobile Trail Conditions blog archives for December, 2008.